The Apartment at Rosetti Park is a unique bedroom with a king bed, private bathroom with in-room refrigerator and coffee maker. The flat screen television is equipped with a DVD player and movie collection, along with secure wireless Internet. Through the sliding glass doors is a beautiful outdoor lounge with bikes a large fountain and patio, and a gas grill. This room truly brings the outdoors in. Washer and dryer included indoors. The Apartment at Rosetti Park is in close proximity to the railroad tracks. Disposable ear plugs are provided, as is a sleep-noise machine. Those with extreme noise sensitivity should consider these factors when making their choice. Roger and Vicki are Ocean Springs natives who have spent the last decade collecting properties to restore and preserve in downtown Ocean Springs to be enjoyed by all. Both are lovers of art, but most of all their home town, friends and family who frequent this property often due to its welcoming vibe. Roger bought this house with an Art Gallery in mind. The front part of the house still has the sign from when it housed a gallery with Wayne Rosetti's work (Vicki's father). The Apartment is nestled in the back of the home, separate, but still a part of this home. The Apartment invites guests to enjoy the cozy bedding and unique artwork in the room, but mostly to take in the outdoors while enjoying the rest of what Rosetti Park has to offer. Just outside the sliding glass doors is an outdoor lounge with rocking chairs and a fire pit, YOLO bikes for use, a grill, an expansive patio with seating area to enjoy the seasonal South Mississippi weather, and best of all, access to downtown Ocean Springs through the property's back gate. Private full bathroom in suite. Just out the back gate of the Apartment at Rosetti Park is downtown Ocean Springs. Visitors will find dozens of shops, restaurants, bars and live music all in walking distance. Hi Speed wireless Internet and Apple TV provided for streaming of your favorite music or entertainment options. Mini refrigerator in room to hold beverages or light snacks and breakfast. The beautiful patio of the Cottages of Rosetti Park is your back yard. Private outdoor lounge and fire pit are steps from your door. Guests of the Apartment may share the pool area when the Art House property is not rented. Our stay was everything we had hoped for. Quaint, serene and peaceful! The property is just beautiful! Great location ! Vicki and Roger were wonderful hosts! We will be back again and refer to our friends! Thank you for a lovely stay! The apartment was great! Clean and comfortable. Everything we needed and more. Close enough to walk to restaurants and shopping. The outdoor space at the apartment is really nice. Definitely will stay again! Vicki was wonderful and easy to contact. The room was perfect for my husband and I. The backyard area was absolutely beautiful! We were not bothered by the train tracks either. Overall, it was wonderful and we will stay here again!! Rosetti Park is exceptional. I totally recommend staying at Rosetti Park, Vicki is very accommodating and grounds are spectacular. You will love every minute of your stay. We absolutely loved our stay! So much that we stretched a 2 night into a 3 night stay! Vicki was wonderful letting us stay the extra night. Very easy and quick. 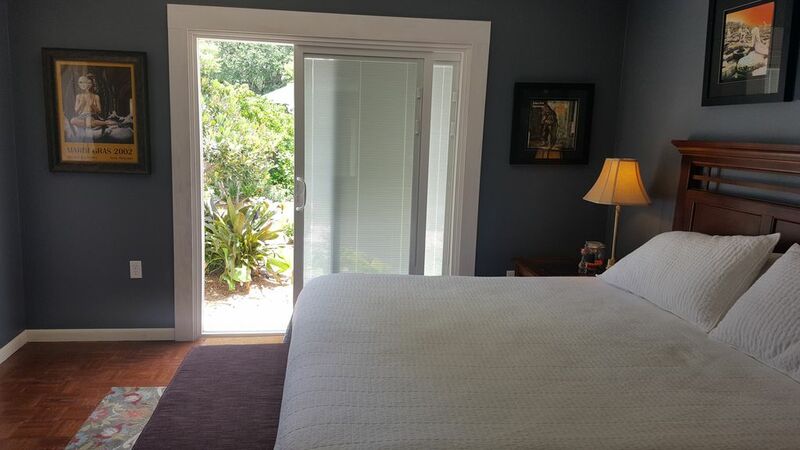 It is everything you need for a great stay in Ocean Springs. Very short (and safe)walk to Government St. Maybe 5 minutes.It is close to the railroad but it didn't bother us one bit. We will be back! Great little one bedroom within walking distance to downtown or just a place you can relax. Sure it is by the train tracks but they really did not bother us. We would definitely stay there again!! Just minutes away find quaint Downtown Ocean Springs with shopping, dining and entertainment along Washington Avenue and Government Street. For outdoors-lovers, find the Gulf Islands National Seashore park system. Or, rent a boat from The Hook Up and seek out the barrier islands or bay waterways. Ocean Springs is an artistic community, boasting their renowned Anderson family roots. Less than one mile away find the Walter Anderson Museum or seek out Shearwater Pottery, an operating Anderson studio. Minutes over the Biloxi Bay Bridge see Frank Ghery’s George Ohr Museum, as well as the Maritime and Seafood Industry Museum Sea Camp. There is an outdoor pavilion and splash pad for the kids. Of course, also in Biloxi is a thriving nightlife at any of the Coast casinos or downtown. Downtown Ocean Springs turns up the live music after dark in the downtown entertainment district at Mosaic Tapas Bar, Kwitsky’s Dugout and the Government Street Grocery. Whatever your taste, you can find it in Ocean Springs, one of Coastal Living Magazines “Happiest Seaside Towns” in 2015. Guests are expected to adhere to all City of Ocean Springs ordinances and are subject to enforcement of those ordinances.